East Millinocket – Judith A. Theriault, 83, passed peacefully when she lost her battle with Parkinson’s, Thursday, October 18, 2018 at her home in East Millinocket, with her husband, children, and granddaughter by her side. She was born December 12, 1934 in Millinocket, the daughter of Harry A. and Elizabeth P. (Roach) Fiske. Judy grew up in Medway, and was a graduate of Nicatous High School. 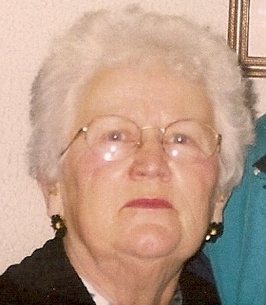 She attended nursing school in Bangor, and ran many businesses with her husband, including Pine Grove Campground, Theriault’s Print Shop, and Movie Kingdom. She also worked at the Katahdin Nursing Home and was a faithful communicant of St. Peter’s Parish and was a member of the Daughters of Isabella, St. Ann’s Circle in East Millinocket. Judy lived a full and happy life and had many great girl friends who she loved to travel with, along with her husband. She enjoyed bird watching, especially the woodpeckers and hummingbirds. The family would like to thank the CHCS hospice nurses for the great care they gave Judy in her last months. She will be missed and loved by all who knew her. Judy is survived by her husband of nearly 64 years, Charles W. Theriault, Sr.; three children and their spouses, Chuck and friend Sue, Beth and Jimmy, and David and Chris; grandchildren, Katelyn and John, Benjamin and Kristen, Brandon, Eric, and Kasey; great grandchildren, Aubrey, Grady, Gracie, and Kyle; a sister in law, Patricia Theriault; one niece, Jan and two nephews, Mark and Patrick. In addition to her parents, she was predeceased by her in laws, Martin and Ellen Theriault, a brother in law, David L. Theriault, two daughters, Kim Ellen and Anne Marie, as well as many friends. Friends are invited to visit with the family 10-11 A.M. Saturday, October 27 at Christ the Divine Mercy Parish, St. Peter’s Catholic Church, 58 Cedar Street, East Millinocket, where a Mass of Christian Burial will be celebrated at 11 A.M. with the Rev. Bruce Siket, pastor, presider. Interment will be at the East Millinocket Cemetery. Gifts in memory of Judy may be sent to Waiting Whiskers, P.O. Box 221, Sherman, ME 04776. Arrangements are by Lamson Funeral Home, East Millinocket. To plant a tree in memory of Judith A. "Judy" Theriault (Fiske), please visit our Heartfelt Sympathies Store. So very sorry. Judy was such a sweet lady. Thinking of you all. 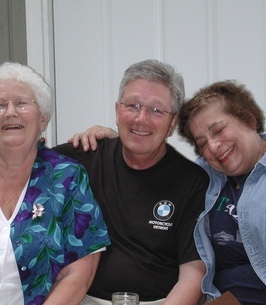 The wonderful Theriault girls with cousin-in-law, Mark, at Cedar Lake in 2003. Great memories. Judy was a wonderful lady and will be missed.